You’ve already surrendered to Colorado’s unique charms: sunshine sparkling in a cloudless sky, exhilarating open spaces flanked by towering peaks, friendly towns with endless enclaves to explore. Why not add an extra layer of adventure by staying somewhere that’s just as special as the Centennial State itself? Check out this list of fun retro lodging options that are anything but basic. If you want an unforgettable experience but you’re not looking to rough it, these historic inns are just the ticket. Along with the usual creature comforts, you’ll find unexpected amenities and details from the days of yore. Head back to school — without having to hit the books — on a visit to Carr Manor, a stately B&B located in the old mining town of Cripple Creek. Built in 1897, the building served as a high school for almost 100 years before being converted into a hotel. Beautifully restored with late 19th-century décor, Carr Manor even retains some of its scholarly touches, like classroom chalkboards and school desks. Stroll to Cripple Creek’s downtown casinos, restaurants and shops; or venture farther beyond school grounds on a field trip to Pikes Peak. Sleeping in a barn might not sound romantic at first, but if you head just south of Glenwood Springs to Four Mile Creek B&B, you’ll quickly become a believer. Originally homesteaded in 1885, this tranquil creekside spot was first home to Four Mile Ranch and later a working dairy farm. Now you can stay overnight in the cozy Red Barn Suite, equipped with radiant heating, a kitchen, fireplace and sweetly rustic accents. The B&B also has two cute log cabins and a guestroom in the main house. Spend the day at Sunlight Mountain Ski Resort, just a quick drive up the valley. 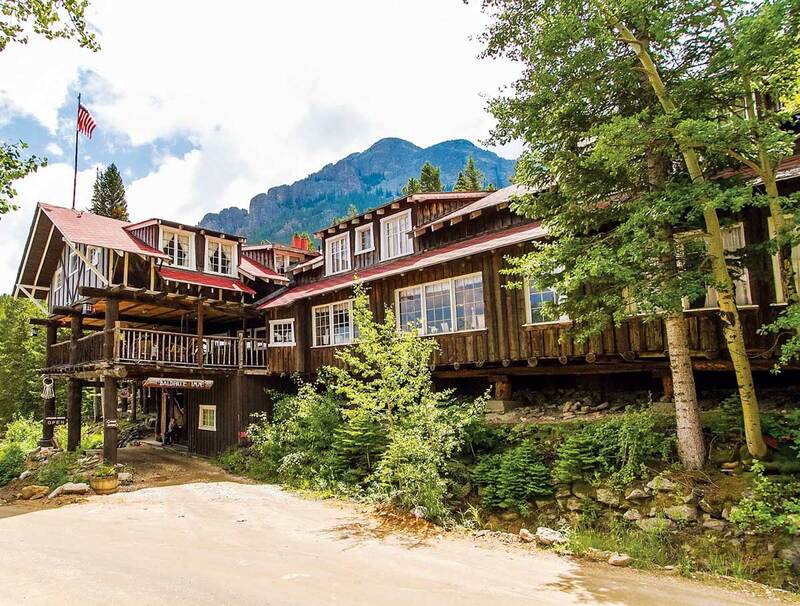 Perfectly positioned south of Estes Park and besides Rocky Mountain National Park, the Baldpate Inn is a classic mountain retreat with jaw-dropping views around every corner. The idyllic setting isn’t its only draw — the inn also boasts the world’s largest key collection. When the Baldpate was founded in 1917, the owners gave guests keys as souvenirs, a tradition that evolved into guests donating interesting keys back to the inn. See more than 20,000 keys in the on-site museum, including examples from the Pentagon, Westminster Abbey and Mozart’s wine cellar. Add a twist to your trip by choosing one of these quirky locales to set up camp. You’re sure to come away with a campfire tale or two to share. Vintage enthusiasts will swoon over the throwback digs at Starlite Campground near the Royal Gorge in Cañon City. The property offers cabins and tent sites, but the real superstars are nine retro campers that have been returned to their true mid-century majesty, each with its own groovy theme. Kick back in the Flamingo Lounge, accompanied by a friendly pink (plastic) flock and hitched to a matching 1958 Chevy Biscayne (naturally). Or indulge your glam side in the Hollywood-themed Sophie, complete with a red car­pet and photos of silver-screen stars. The on-site pool and playground make this a great getaway for the whole family. Whether or not you believe we’re alone in the galaxy, you’ll get a kick out of camping at the UFO Watchtower in southern Colorado’s San Luis Valley. Just follow the roadside alien signs pointing the way to a domed building located on 600 acres of open space in Hooper. While you’re there, examine documentation of recent sight­ings and visit the energy garden, the confluence of two reported vortexes. At night, settle in to contemplate the cosmos, as the lack of light pollution creates ideal stargazing and UFO-spotting conditions. Nearby Great Sand Dunes National Park and Preserve — another other­worldly sight — is an excellent daytime destination. Camp off the beaten path in northwestern Colorado, where the Villard family has been managing a free-range herd of sheep at Villard Ranch in Craig for 90 years. You can partake in the tradition by spending the night in one of their sheep wagons (once used by working sheep herders), located at a site of your choosing. Select a spot near town in a lower pasture, or find peace in a higher-elevation aspen grove. For a truly authen­tic experience, stay at the ranch to help out with spring lambing (complimentary baby-animal ogling included). The Western Slope’s North Fork Valley is famous for bountiful orchards and stunning mountain vistas. Make the most of both by camping at Delicious Orchards in Hotchkiss, where you can pitch your tent among the organic cherry, peach and apple trees. Bring your appetite, as you’ll want to sample the fresh, local wares available at the farm store and cafe. Or if you’re up to the task, pick your own sun-ripened fruit straight from the branch, then reward yourself with a can of the orchard’s own Big B’s Hard Cider. Expand your perspective at these one-of-a-kind lodging options that will appeal to history buffs and nature lovers alike. Travel back to the Old West at Greeley’s Platte River Fort, an adobe masterpiece built as a replica of the historic Bent’s Old Fort in La Junta. Originally a private residence, the property was remodeled into an event space and inn in 2015. Accommodations include luxurious suites, bedrooms and rustic bunkrooms. During your stay, hike or bike Greeley’s many trails, go tubing on the South Platte River or just watch the sunset over Longs Peak as you sip a drink by the fire. Enjoy incredible views from the Jersey Jim Fire Tower in Mancos, perched 55 feet above an aspen-ringed meadow in the San Juan National Forest. Named after an early cattleman who ran Jersey cattle in the area, the tower was home to the U.S. Forest Service fire lookouts from the 1940s to 1970s. Climb the stairs to the cozy living quarters, equipped with furniture, a kitchen and 360-degree windows. Book well in advance — reservations fill up quickly every season. If you’re looking for an elevated experience a little closer to Denver, stay a night or two at Squaw Mountain Fire Lookout Tower outside of Idaho Springs. The former lookout tower sits at the summit of Squaw Mountain and includes a kitchen and living quarters. You’ll have to hike or snowshoe about a mile from the parking area, but the glorious panoramas of Mount Evans, Pikes Peak and the Front Range — especially at sunrise and sunset — is worth the sweat.